Classic blazer, Babylonia, is a chic premium buff leather jacket drawing inspiration from English blazer history. 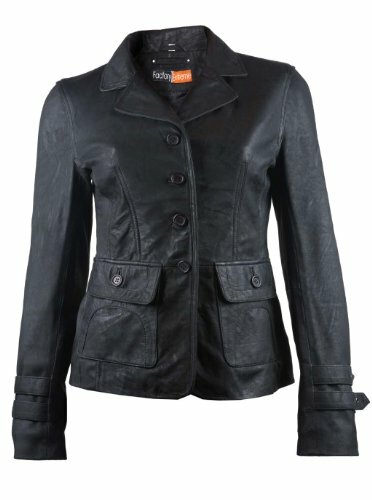 This jacket comes with front and back sleek princess seams, which give length and perfect form to body. Sleeves buckled straps and body pockets with topstitch add poise and elegance to entire the outerwear, making it a quintessential cover-up garment for this season. Babylonia is versatile in its outlook so it can be worn at day business meetings or at special evening programs. Please note that this specific Leather Jacket is offered with FREE Bespoke or Made-to-measure size customization to ensure a Perfect Fitting Leather Jacket only for our esteemed Amazon customers. Alternatively, we can always send standard USA/European sizes. All our custom made or standard size Leather Jackets are backed with 100% Fit Guarantee & hassle-free returns (in case of any reason whatsoever within 30-days even if its a tailor made custom fit Leather Jacket). Once you place the order, we send full video/picture guide showing exactly how to get your customized measurements. Furthermore, if for any reasons you are confused we would guide you on the phone to ensure that everything is perfect before we dispatch your order. If you need to speak to a sizing expert, contact us via Amazon and we would call you to explain the process. In all cases, whether we send you a standard USA/European size or a tailored leather jacket, we will 100% make sure that YOU WILL GET A PERFECT FITTING LEATHER JACKET! ✪ SPECIAL Christmas / New Year Promotion: ►FREE SHIPPING◄ on all our Leather Jackets - Valid till 31 Dec 2015 Only! If you have any questions about this product by FactoryExtreme, contact us by completing and submitting the form below. If you are looking for a specif part number, please include it with your message.